I spent my whole life trying to be healthy. I rarely consumed alcohol, never smoked, occasionally ate red meat, exercised five days a week and I was rewarded with Kidney Cancer. It’s amazing how my life changed in an instant. The instant before I shook hands with the doctor and the instant after, when he quietly informed me that I have Cancer. A sick, lonely fear crept down my body making its way to my stomach….It was like a scene from a dreary movie where someone else is being diagnosed with Cancer. This was not happening to me! My doctor explained that it appeared like the Cancer had not spread, but that he would need to remove my entire kidney. He was right, and I am here 2 years later minus a kidney, my mother (who passed away 1 month after my surgery) and my fragile ego. I have put together a list of products and activities that have helped me. Regular aerobic and weight training exercises. I do a modified the P90x program to better fit my needs as a life long workout instead of 90 days. Interacting and really connecting with friends and family. Positive books on faith,healing and prayer. An iPhone app called Pranayama Breathing that I use when I feel anxious. I just follow the breathing pattern and it calms me down. My DAVID PAL mind machine (see review). 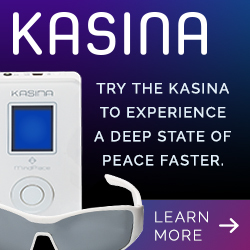 This brainwave entrainment audio-visual device really works in reducing my anxiety very quickly. I usually use one of the Alpha or Theta Brainwave session when I am anxious and the sub-delta before I go to bed. It is expensive but it seems to work for me. Prayer in whatever form works for you. In the next couple of posts, I will mention changes to my diet to include daily green smoothies and lots more veggies plus the results of a study showing the effects of vegetable extracts on different cancer cells. .